Today we're back in the Brooks Lane of 1974. Seven years after it closed down, quite a large proportion of Seddon's Brooks Lane Works is still standing, including that chimney on the left of the picture which we last saw here. In fact, as we've had occasion to mention before, the Brooks Lane works, unlike all the other works still operating in Middlewich at the end of open pan production in 1967, never really disappeared completely and remnants of it are still discernible in Brooks Lane today as newer industries such as Tarmac Readycrete have opened in the shell of the former salt works. Pleasingly, one computer firm we (almost) had dealings with earlier this year gives its address as 'The Old Salt Works, Brooks Lane, Middlewich'. 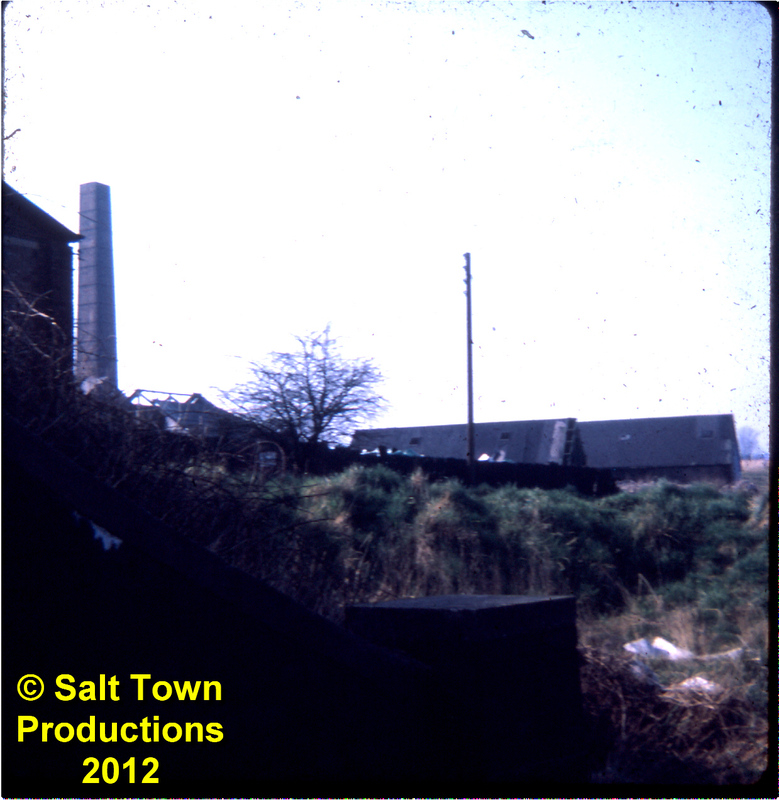 On the extreme left of the slide, next to the chimney, is the corner of Seddon's railway wagon repair shop - often mistaken for a railway engine shed, which it closely resembles - which has, against all odds, survived to the present day, albeit in a derelict condition. On the other side of the chimney the dilapidated roof of one of the salt pans, with many of its roof panels missing, can be seen. To the right are the two buildings, with their distinctive black tarred roofs, fronting onto Brooks Lane, which are also evident in this slide from a few years earlier. Beyond the grassy bank in the middle of the picture the River Croco makes its semi-subterranean way into Middlewich, running through tunnels under the road to meet the Trent & Mersey Canal at the lower of the three Brooks Lane locks, where it continues to flow through the town,confined in its channel alongside the canal, until it runs into the River Dane at the bottom of Harbutt's Field. The square structure in the foreground is part of a railway bridge. We're actually standing on the public footpath which runs from Brooks Lane, under the railway and alongside the access road to the sewage works ('Prosperity Way'), to join the 'Middlewich Eastern Bypass' on Midpoint 18, shortly before that road gives up the struggle and runs out of steam in the middle of a field. It's interesting to note that this slide was taken from a point just a few yards away from a suggested site for the platform of the proposed new Middlewich Station. When the new station is built, who knows what the future holds for this part of town? That new Network Rail radio mast is on the embankment just behind the camera.